July 16, 2017 – Portland, Oregon – Nick Moon is as passionate about sound quality as he is good music. 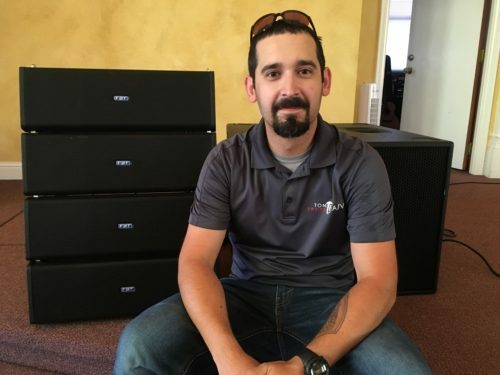 As the owner of three companies – a studio (Tone Proper Mastering), an AV company (Tone Proper AV) and an acoustics business (Tone Proper Acoustics) – he’s spent countless hours working with professional musicians and sound technicians. His days are spent listening to the tiniest details of every note, on projects ranging from recording to live performances. And when it comes to his clients, he’s not willing to give them anything less than the very best a sound system can offer. Not all of his clients have big names or big budgets, though, so Moon used to struggle with the ability to recommend speakers in a lower price range that met his high standards on sound. Thanks to FBT, he says, he no longer faces this challenge. Moon got his start in 1999 working in studios in Chicago and Texas before settling in Portland and starting his own businesses. Since then, he’s grown to work with heavy-hitting artists like Liv Warfield and Gino Vanelli, record labels like Universal and on well-known television programs such as the Arsenio Hall show. But he also works with musicians, sound engineers, companies and venues who want high quality, and don’t, he says, “have six figures to spend on a sound system.” Moon explained why FBT has become his “go to” brand for clients in these scenarios. Moon has installed several Mitus 206LA’s in a few local churches, purchased a rig for his own personal use, and has plans to use the brand in several of concerts, festivals and live performances he’ll be doing this summer. “One of the best parts about working with FBT as a brand is working with John Krupa and Italian Speaker Imports (I.S.I. ), which is the distributor for the brand here in the states,” Moon continued. Saying that he prides himself on giving the best to his own clients, he explained why I.S.I.’s customer service is so crucial to his own business.